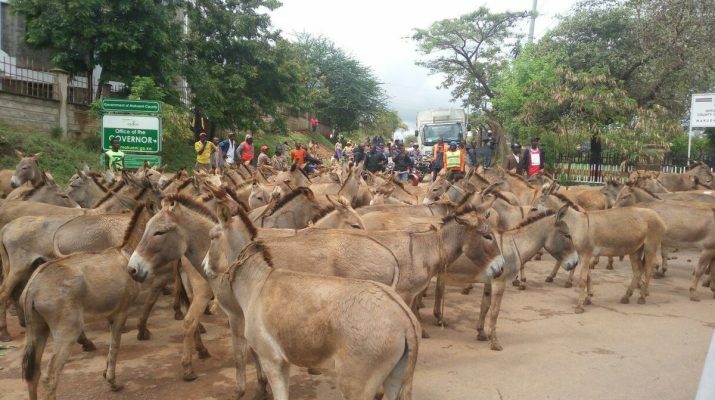 Traders protest order denying donkeys inside Makueni market – Kenyatta University TV (KUTV). All Rights Reserved. About hundreds of people went on protest today in Makueni following an order to keep donkeys away from the market. The order required that those who use donkeys for business, fetching water and carrying goods, to make sure they keep them off the market as a sanitation measure. Full of furry and anger they matched with teir donkeys to Kivutha Kibwana, governors office to raise their grievancies. The protersters termed the move un-acceptable and demanded that the govoner recalls the order to have the traders move the donkeys off the market. In Makueni, donkeys have higly been used in carrying heavy loads like water, serals among other areas especially to or from areas that vehicles cannot access. With looming water business in Makueni County, donkeys have higly been valued as the cheapest and most reliable means of transport.